Whether in Germany, Europe or in the States, BONFIRE are, and will remain, rock giants. Without their influence on the melodic rock scene, an important chapter in international rock music history would have remained unwritten. Whatever the future brings, one thing is clear - the tours are running, the gigs are booked and the guitars are red hot - the BONFIRE is still burning! Vocalist Claus Lessmann and guitarist Hans Ziller gathered the hard Rock quintet CACUMEN around them at the beginning of the 1980s in Ingolstadt, whose incidently have recently been re-released on CD. The quintet first released two albums "Cacumen" (1981) and "Bad Widow" (1983) through different Indie labels. CACUMEN took the fans of hard & heavy sounds by storm, but it took three more years before the absolute break-through for the songwriting duo Lessmann/Ziller, when they changed the name of their project to "BONFIRE". BONFIRE's debut album "Don't Touch the Light" (1986) became one of the most successful first releases by a German band of this genre thanks to its perfect mixture of haunting melodies and chilling crystal-clear rock music. The follow-up album "Fireworks", released one year later, stayed in the German album charts for thirty weeks and is considered to be the "Made in Germany" Hard Rock classic to this day. Furthermore, BONFIRE have confirmed their reputation as exceptionally good live musicians during their extensive tours around Europe - with ZZ TOP and JUDAS PRIEST, among others. When put to the test, BONFIRE can sweep away a more mainstream-oriented audience as well as die-hard heavy metal fans with their thrilling performances. But in the middle of working on their third album "Point Blank" (1989) - which, like the earlier albums, was produced by master producer Michael Wagener - guitarist Hans Ziller left BONFIRE because of insurmountable differences with the management and began a project of his own called EZ LIVIN'. In the meantime, singer Claus Lessmann and Co. reinforced their status, which they had worked so hard for over the years, with the release of Point Blank. Their tour through Europe at the end of 1989 was completely sold-out and left a lot of happy fans with unforgettable memories of their concerts. In 1991, BONFIRE recorded its fourth album "Knockout", under the direction of veteran producer Mack (QUEEN and others). "Knockout" is more melodious, more easy-going than its predecessors, but the album still sold more than 60,000 copies to fans, who stayed loyal to earthy, genuine Rock in spite of the then-rising boom in Grunge music. After a two year rest, vocalist Claus Lessmann and his old songwriting partner Hans Ziller came back together to try their hand at German language Rock - the result was the EP "Glaub dran" (1994). Thus, the 1996 release of "Feels Like Coming Home", an album which also includes "Glaub dran"- material, now completely re-arranged and equipped with English lyrics, can be considered as a return to old strengths and as a final rehearsal for the comeback, which BONFIRE had one year later with "Rebel Soul", an album recorded with almost the same line-up which they have at present. Still in 1996, a limited edition of the German language album "Freudenfeuer" was released. Since BONFIRE were back together again, 10.000 copies of the album were sold in no time and the album is now considered a collector's item. In the meantime "Rebel Soul" turned out to be a highly stimulating Rock opus, with which the duo Lessmann/Ziller and their band members made clear that "Hard Rock from Germany" is more alive than ever, even though there are some harsh winds blowing in this particular field of the music business. In 1999, the quintet succeeded in reviving the "good old days" vibes with their album "Fuel to the Flames" and they brought back to life the spirit of albums such as "Don't Touch the Light" and "Fireworks". Even though the business atmosphere for traditional Rock sounds was hardly optimistic at the time, "Fuel to the Flames" entered the German album charts right off at No. 32 and stayed in the charts for a respectable seven weeks. "Strike X", recorded at Munich's legendary Sator Sound Studio and released in April 2001, continues uncompromisingly with the back to the roots motto of the four musicians from Ingolstadt. The opening track "Under Blue Skies" fascinates the listener with its symbiosis of dark and heavy beats, reminiscent of BLACK SABBATH, and its epic-monumental nuances on the one hand, while following a haunting melody in the vocal part on the other hand. A successful European tour followed the release of this album. 2002 saw the release of the long-awaited double-album and DVD "29 Golden Bullets - The Very Best of BONFIRE", to the delight of old and new fans alike. BONFIRE are with this album once again No.1 in the rock scene and were seen playing continuously throughout Europe on the "Golden Bullets tour". Despite numerous successes and a clearly promising future, Chris Lausmann decides to part from the band after twelve years due to personal reasons. 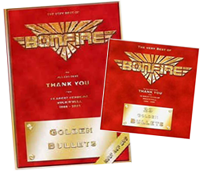 A growing fan-request for a new live album grew to a peak in this year and as a result the album, "Golden Bullets - Live over Europe" was released in November together with the publication of the band`s new award-winning website "The-Flame.com" - today "www.bonfire.de". Few realized it, but the band followed their creative drive and were already making plans for the future in shape of a partnership with Swedish song-writer and hit-maker Marcus Black for the single "Tell Me What U Know". Following a successful European Tour as support for WHITESNAKE, the studio-album "Free" was released. A highly professional and well produced album that entered into news realms of experimentation for the band and nevertheless managed to enter the official German album charts. 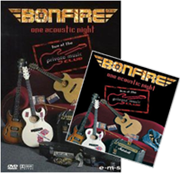 Continuing with their creativity and underlining their talent to never fail to surprise, BONFIRE went on to release "One Acoustic Night - Live at the Private Music Club" - a clear statement and a chance to draw breath before going into the studio once more and commencing work on a new studio album. Already on board: new guitarist and studio wizard Chris Yps Limburg. BONFIRE, whose songs have sold over 6 million copies worldwide, remain ambitious and are always eager to strive for new goals. Towards the end of "One Acoustic Night"-tour came the South-East Asian tsunami catastrophe for which Claus Lessmann and Hans Ziller brought the "Rock for Asia" into being - a benefit concert of mammoth proportions involving numerous renown names from the world of rock. Over 100.000 euros were collected through this gala concert in Ingolstadt alone, which included a surprise make-over of one of the band's most well-known hits "Rock`n Roll Cowboy" 2005. The release of the "One Acoustic Night"-CD and DVD featuring the Spanish version of "Rock'n Roll Cowboy" followed together with numerous gigs in Greece and Spain. There's no doubt about it - BONFIRE have still lots planned and after more than 1200 live gigs, still set standards for hard rock. April 2006 saw the release of the band's latest critically acclaimed studio album "Double X". The album came hand in hand with a jubilee tour, beginning on the 29th of April, which took the band across Europe for a whole year with storming appearances in Sweden (the legendary Sweden Rock Festival), Greece, Spain, Italy and England. In the United Kingdom at the well-known "Firefest" the band has recorded and later on released a Live-DVD and CD entitled "Double Vision". In 2008 "The Räuber" has been released. Not only the new BONFIRE-album but also the soundtrack to the hugely successful new rock opera-version of the classical Friedrich Schiller-play that has been brought to the theatrical stage in Ingolstadt and has already seen dozens of sold-out performances. One of them has also been presented on the official "The Räuber"-double-DVD - next to tons of spectacular bonus features and the video to the new version of the chart breaking ballad "You Make Me Feel". In the meantime "You Make Me Feel 2008" appeared on the latest edition of the mega selling Playstation game "Sing Star". After a storming performance at last year's Rocklahoma Festival - the band's first concert in the USA after 21 years - next to the likes of TWISTED SISTER, RATT, NIGHT RANGER or SKID ROW and after the release of the compilation "You Make Me Feel: The Ballads". BONFIRE have released a very special single on Universal Music: the sensational rock version of the German national anthem simply called "Deutsche Nationalhymne". BONFIRE's first Top 40 single ever and a single that stayed in the German single charts for weeks. In 2011 the band is celebrating it's 25 anniversary with the new studio album "Branded". That came out in January hit the official German album charts and the band celebrated that fact release big-style throughout the year. Many concerts and festivals with the likes of JOURNEY, FOREIGNER, CINDERELLA, HAMMERFALL, JOHN WAITE, EDGUY, H-BLOXX and NIGHT RANGER have been played followed by the release of the Live-CD "Fireworks .... Still Alive" in the fall. Preparations for the next BONFIRE studio album have already started but will be interrupted by another prestigious project. The cooperation with the world-famous organization PETA through the beneficial EP "Cry 4 Help" due out in May 2012. In mid-December 2014, Hans Ziller started his re-awakening of the new BONFIRE. The new line-up was David Reece (vocals), Hans Ziller (Git), Frank Pan� (Lead-Git), Ronnie Parkes (Bass) and Tim Breideband (dr). Recording began on a new album "Glörious" in Milan Italy. "Glörious", consisting of 12 new songs and some bonus tracks was released in April / May 2015 worldwide. "Glörious" reached the Top 40 on the Media Control Charts and spent 10 weeks in the GERMAN ROCK TOP TEN, proving that BONFIRE was back and still going strong. BONFIRE toured from April to December 2015, completing more than 60 well visited shows at home and abroad to enthusiastic crowds. The band also released two videos for the songs "Remember" and "Nothing At All". 2016 marked the 30th anniversary of BONFIRE. For this outstanding landmark Hans Ziller and Co. have completely re-recorded the most popular songs of the last decades: "Pearls" (UDR-Music / Warner Bros). 22 songs on a double CD album which was released on 18.3.2016. A fresh new take with the remarkable musicianship of the new lineup while still maintaining the spirit of the past 30 years. Also in 2016 Hans Ziller made a pledge to make BONFIRE great again. He recruited a new face to the line-up of BONFIRE: the remarkable German vocalist ALEXX STAHL, an exceptional singer and outstanding entertainer. Alexx has brought new life to the songs and returned Bonfire to The Deutschland Rock Legends as they have been know for the past 30 years. With BONFIRE veterans guitarist HANS ZILLER, guitarist FRANK PANÉ and bassist RONNIE PARKES in the addition of vocalist ALEXX STAHL and drummer TIM BREIDEBAND, BONFIRE now have the fire and energy they were so well known for and truly make them a force to be reckoned with once again. With their heavy touring schedule, over 80 shows in 2016, BONFIRE at the same time recorded their new album "Byte the Bullet" (UDR-Music / Warner Bros) at Flatliners studios in their hometown Ingolstadt, Germany. "Byte the Bullet" was released on March 24, 2017 and again found the German legends in the top 40 charts. It is a powerful album, bringing the band back to its roots by guitar driven rock with great melody and vocal hooks and a much heavier edge. With the incredible new line-up Byte the Bullet proved to their fans that not only was Bonfire back, but they were back with a vengeance! 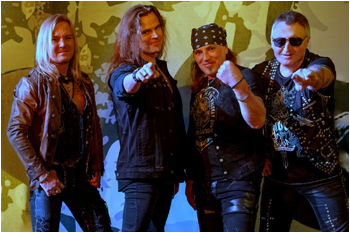 In early 2018 Bonfire again faced struggles and parted ways with their management and also signed to AFM records. They then released the follow up to the successful "Byte the Bullet" album. With "Temple of Lies" at this point everyone was taking notice of Hans Ziller and company. The album reached #28 on the official German charts and also charted in Switzerland, which the band had not seen since the Fireworks album. An extensive tour followed and included some mega shows including the legendary Wacken Open Air and reached countries like Bulgaria and Belarus. While touring for the "Temple of Lies" album the idea arised to put on a very special concert tour called Bonfire & Friends featuring renowned legendary vocalists as guests and Bonfire as The Band. In the planning stages and while touring Bonfire returned to Flatliners studios in Ingolstadt and recorded the monstrous double CD Legends: 32 songs, covering classics from acts such as Rainbow, Deep Purple, Survivor, Toto, UFO and more. After 3 years and 4 albums, BONFIRE and drummer Tim Breideband split in February 2019 by mutual agreement and in all friendships. As new drummer André Hilgers was announced. André, who previously worked with RAGE, SILENT FORCE, AXXIS and SINNER, is one of the best drummers in his genre and will give Bonfire another powerful push forward with its class and experience. Bonfire is continuing to tour in 2019 and will release a live DVD from Wacken and a new album in 2020.